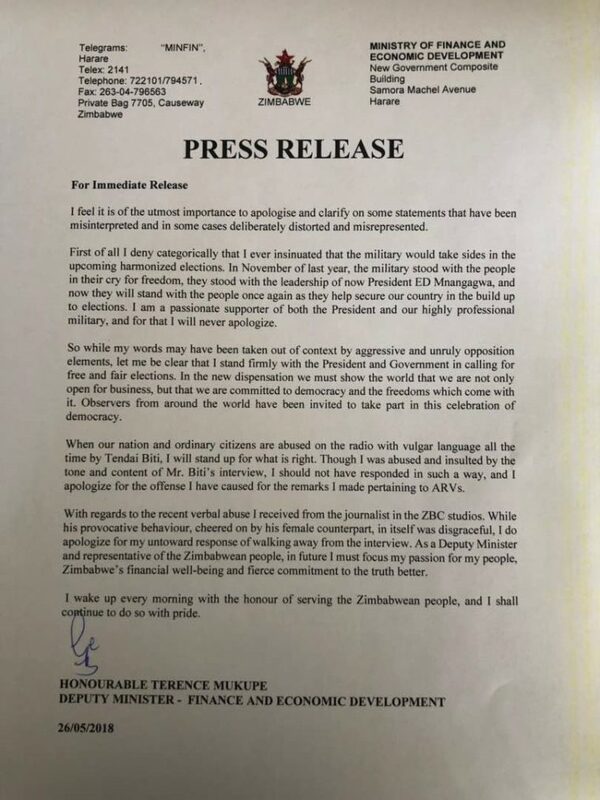 Zimbabwe’s Deputy Finance Minister Terence Mukupe, who is under pressure to resign following his statement that the military will not allow opposition leader Nelson Chamisa to take over even if he wins the coming elections, has issued an apology but says some of his statements were misinterpreted and in some cases deliberately distorted and misrepresented. He issued the statement today but it is not clear why the statement was on a Ministry of Finance letterhead and whether the statement is really his. The Zimbabwe African National Union-Patriotic Front has condemned Mukupe’s remarks saying if he said what he is alleged to have said, then he directly undermined the party chief President Emmerson Mnangagwa. Mukupe today denied “categorically” ever insinuating that the military would take sides in the upcoming elections. “In November of last year, the military stood with the people in their cry for freedom, they stood with the leadership of now President ED Mnangagwa, and now they will stand with the people once again as they help secure our country in the build up to elections,” he said. “I am a passionate supporter of both the President and our highly professional military and for that I will never apologize. “So while my words may have been taken out of context by aggressive and unruly opposition elements, let me be clear that I stand firmly with the President and Government in calling for free and fair elections. Mukupe also apologized for his statement on people with HIV but blamed everything on People’s Democratic Party leader Tendai Biti. “When our nation and ordinary citizens are abused on the radio with vulgar language all the time by Tendai Biti, I will stand up for what is right. Though I was abused and insulted by the tone and content of Mr. Biti’s interview, I should not have responded in such a way, and I apologize for the offense I have caused for the remarks I made pertaining to ARVs,” he said. Mukupe also claims to have been verbally abused by a local journalist at the ZBC studios but apologised for walking away. “I do apologize for my untoward response of walking away from the interview. As Deputy Minister and representative of the Zimbabwean people, in future I must focus my passion for my people. Zimbabwe’s financial well-being and fierce commitment to the truth hither. “I wake up every morning with the honour of serving the Zimbabwean people, and I shall continue to do so with pride,” he concluded. Mukupe’s statements have sparked a lot of debate with people saying that if he is not fired it means that Mnangagwa and the military agree with what he said.